Our organically crafted Coffee Body Butter is derived from the cold pressing of the premium quality, roasted Indian Coffee Seeds (Coffea arabica), grown specifically in the hill tracts of Southern India, to render the anti-oxidants rich, organic Coffee Bean Oil. This oil is then combined with our proprietary exotic butter base using our unique blending process to produce a caramel colored butter with luscious, rich aroma of fresh roasted coffee and excellent antioxidant properties suitable for skin care. Coffee is one of the richest sources of antioxidants which protect the skin against free radicals that damage the skin. It also helps restore skin smoothness and protects against ultraviolet light. The natural Caffeine in Coffee Butter stimulates the skin and improves blood flow to the face, which makes the skin look fresh, radiant and bright. It tightens the skin to reduce the appearance of cellulite and also prevents wrinkles. 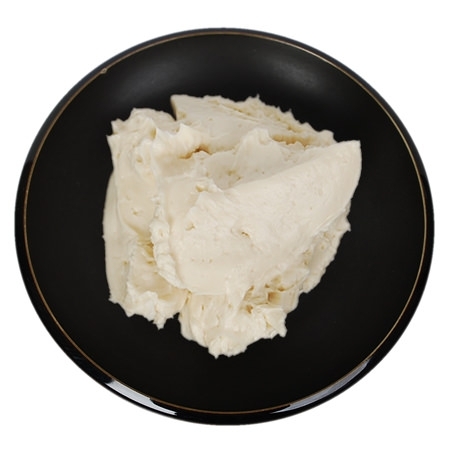 Coffee Butter exhibits excellent spreadability with an exceptional smooth and elegant skin feel, making it ideal as a massage butter or carrier for treatment products.